May 16, 2013 by Melinda Viergever Inman, 6 Comments, in Character formation, God's Love, Spiritual Growth, Transformation, Why serve Christ? Everything we need? Really? Do we believe that? How often do we consider that, when we actively seek to know Jesus more intimately and allow that knowledge to change our lives, God’s divine power provides everything we need? We don’t need to get older or richer or poorer. We don’t need to pay off our debt or conquer our addiction before we arrive at this place. We can have it now. Knowing Christ gives us everything. He is exemplary in every way! His divine nature changes it all. He is the power source. How? Christ lived a perfect and holy life. He sacrificed himself for us. He longs for us to turn from our feeble attempts and place our trust in him. Then he can bequeath us with his own righteousness. Then he can pour out grace and peace upon us. Then he can swear his great and precious promises, whispering them with love. Then his Holy Spirit can indwell us, enabling us to escape the spoiling effect of our fallen world. In Christ, we can have it all. Yet I’ve been crying off and on for days. I’m weary and worn from a long haul of work. I’m still spent from the twenty-eight-year-long homeschooling marathon that ended a year ago. And I’m mourning. I needed God’s word today like medicine. 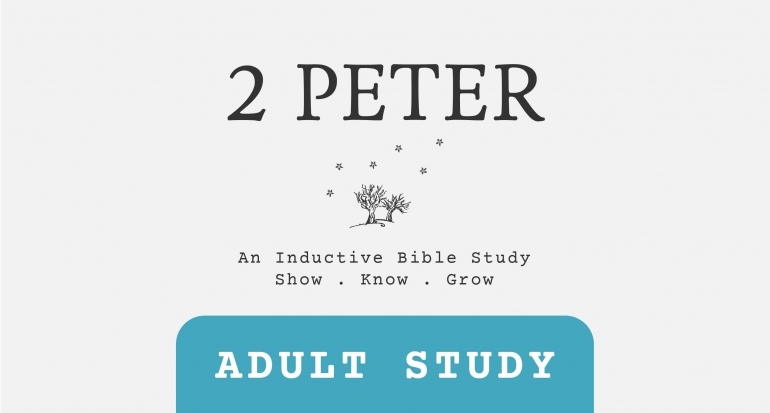 As I started into a study of 2 Peter, sacred words cascaded over me, warming my heart and uplifting my soul. Peter wrote to remind believers. Without God’s transformational power, Peter said, I would have no faith. Yet, God chose to give it to me. My faith—mine, an insignificant woman who is virtually unknown—is as precious and valuable to God as the faith of the apostle who penned the letter. The same is true of your faith. Peace with God is mine. Grace—the power that produces godliness and eternal life—has been multiplied to me and to you. The Lord has made me promises of eternal life and heaven waiting, promises of never leaving me or forsaking me, promises of orchestrating all for my good, promises of transforming me into his image. He has promised you as well. Because of his promises and his divine power, I am remade. His Holy Spirit changes me. He enables me to escape from my own sin. With Jesus holding me in his arms and his Spirit inside me, I can recover from the long hospice decline, from the marathon of pouring myself out, from the overwork, in short, from life on this planet. I am his, and he is mine. I have it all. So do you when you belong to Christ. How does knowing Christ enable you to face the trials and heartaches? He knows and understands the pain of living in a broken world – He made that sacrifice for me. The God of heaven made that sacrifice for ME. His wounds heal. His heart knows and He is all-knowing and all-powerful enough to hem me in and touch me in ways that provide just what I need exactly when i need it. He understands when “kids” walk away – He really loved Judas. He really loved Peter when he denied and fled and the others scattered in His deepest earthly test. He “sees” me and I belong to Him – this fuels my heart and feeds my soul when everything is unsure or life goes sideways. I trust Him, because He has proven trustworthy – He is true and just and righteous and gracious. I love Him. Your responses always encourage me, Kripsie Anne. He “sees” us. When we strive to “see” him and know him more thoroughly and completely, he transforms us. Because he is God and light and life, he changes us more into his own likeness. So, we trust. Trusting and loving and knowing him are our life’s work. Yes, I need His Word more than I have ever needed ANY medicine–more than I ever needed chemo or nuclear radiation. It is what gives me hope in the time of any crisis, big or small. Because of His own glory and goodness, not mine, he has given me these same great and precious promises, most precious promises, so that through these promises I may participate in His divine nature and escape the corruption in the world caused by evil desires. Meditating on these precious Words, knowing that we escape the corruption in the world through our relationship with Him. Knowing that His promises are “yes and Amen.” A promise made by God my Savior is certainly going to be kept! He is the promise-keeping God! Everything He promises does come to pass. And, our hope is not a wishy-washy hope but a certainty. Our hope is in Him. It’s not an “if it happens” but a “when it happens!” It WILL come to pass. What would we do without those great and precious promises! Thank you for being honest and transparent. I always marvel at the words that we have everything we need to live a Godly life honoring God. I don’t always believe it because my sin gets in the way. But Jesus overcame that for me and I just need to trust Him. To live truthful and honest lives, we must be transparent. God calls us to encourage others with the comforting we have received from him. So, we have to talk about it as writer/encouragers. It’s so easy to forget who we are and all God says about us. We have to remind one another.